What's Google's objective when it comes to games this year? "The trend or unifying prospect is making Android better for games," Jamil Moledina, Games Strategic Lead for Google Play, recently told TechRadar ahead of the Game Developers Conference (GDC), taking place in San Francisco this week. Since Google Play covers every platform - augmented reality, mobile, wearables, virtual reality and television - that Android does, Google wants to boost gaming from the ground up. To that end, the search giant (and runner of the largest app and game store), is unveiling a number of improvements designed to make discovering, buying and playing high-quality games easier for users, and turn the Google Play Store into an even more attractive home for game makers' creations. The first is a change to the Google Play algorithm that takes user engagement into account, not just how many times a game has been installed, when it comes to promoting games. Google will look at a game's "stickiness" - its retention and engagement levels - as a way to reward quality with better promotion on the store. Traditional measures will stay in place, but this should help games that may not have as many downloads yet engages the users it does have gain more exposure. "Quality of experience is ideally judged in how many minutes are spent in a game - both in minutes played and retention," Moledina says. "[The algorithm] is rewarding quality, surfacing the imagination of the playing public and supporting innovation." Google is also rolling out sales and strikethrough pricing for all app and game makers, allowing developers to run a price promotion on their paid apps and electronic entertainment. Everyone likes a sale; Moledina says in trials of strikethrough pricing, the conversion rating for installs increased from 3x to 20x. By lowering the initial entry price, app and game developers can ideally introduce their creations to more users, and eventually convert them into full-time (and full-paying) customers once the sale is over. Moledina says there's some precedent in the marketplace for this type of price promotion, so many app and game developers should be familiar with the concept. For users, while you will eventually have to pay full price for an app or game, it could open the door to more content that you otherwise may not have considered because of the cost. If anything, you can try something out before deciding whether you want to completely commit to paying for it in full. Finally, Google is introducing editorial pages on Play. Google's human editors will select games to highlight here, providing greater exposure to games they deem innovative and best show off what gaming on Android is all about. Pages will be organized around different themes, and should help users get a better sense of what titles they might not have heard of are all about. What's more, editorial pages will help more games that could easily become buried in the Play Store see the light of day. Along with the new tools, Google didn't come to GDC 2017 empty handed on the game front. 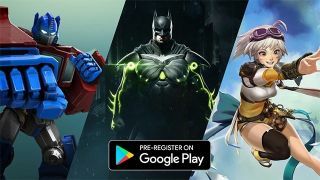 The company is announcing three mobile titles that are available for pre-registration on Google Play right now: Transformers: Forged to Fight, Battle Breakers and Injustice 2. Virtual reality is getting a lift up as well, with two games for VR also arriving soon. Virtual Rabbids is a Ubisoft title, while Beartopia comes from the folks at Spry Fox. This dynamic duo adds to Google and others' efforts to bring more content to the still-nascent virtual reality content space. And though these alone may not convince more shoppers to pick up a Google Daydream View headset, they are nice to have on offer for current owners (and, hey, they may just be the nudge you need to put down $79/£69/AU$119 for Google's VR headset). Will all of this lead to more Google Play Store customers and a boost to games across the board? We won't know for some time, but Moledina is confident in Google is taking the right approach to improve gaming for Android as a whole, not just a particular device category. "Better support [for] high-fidelity games, high performance, more engagement, classical gameplay - all of these are relevant for games on phones and other media."